Wash and scrub potatoes well. 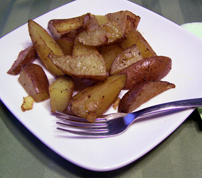 Cut potatoes in half, cut each half in to thirds and place on large baking sheet. Chop onion and add to potatoes. Sprinkle spices over potatoes and drizzle with olive oil. Mix with your hands until well combined. Bake uncovered in a 350 degree oven approximately 25 min. or until fork tender.